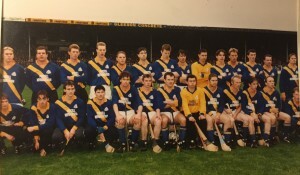 The 1996 County Final – by Charlie Ryan. They said it wasn’t possible, they said it couldn’t be done, they said the Sash didn’t have the talent, they were wrong. Boherlahan-Dualla hadn’t won a County Final since 1941. In recent years however, some promising young talent had emerged. A Minor A County title in 1993 followed by Mid Senior championship success in 1995 meant that hopes were high in the little parish. 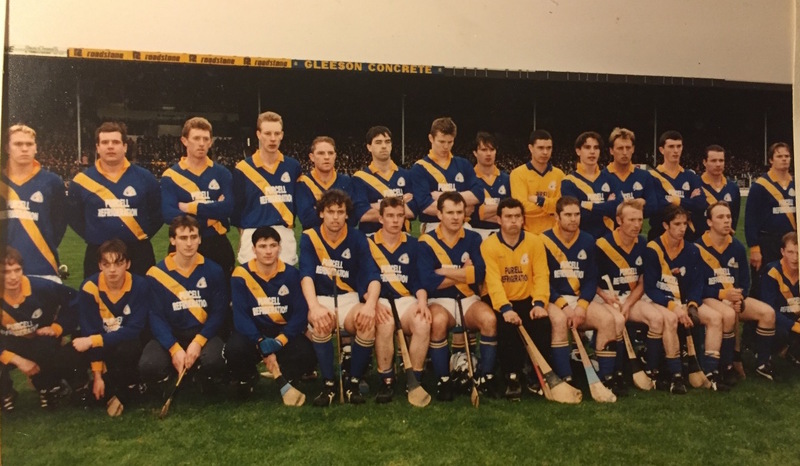 Following disappointment in the Mid Final in 1996, the boys recovered well in the County quarter-final by beating Ballingarry by 2-18 to 1-8. They then faced Cashel King Cormacs in the County semi-final and they produced a stunning performance. In the 21st minute Philip O’Dwyer scored a goal followed by a stunning goal from Michael Murphy. A hat-trick in total on the day from O’Dwyer secured the win that took his team to the County Final against a strongly fancied Toomevara side. It was a mild day in Thurles on 27th October and just under 10,000 spectators came to see a wonderful game of hurling. The North men got a goal in the 14th minute from Kevin Kennedy. It was a tight first 20 minutes, but in the final minutes of the first half Toomevara got three points without reply from Boherlahan, who in fact had missed some opportunities. As the teams went in for half-time the signs were not looking good for Boherlahan. However they started the second half well with two points in the space of three minutes. But as their spirits seemed to rise, Toomevara came back with a point from Liam Nolan and then the finest score of the hour, a second goal from Kevin Kennedy, to put the Greyhounds in front by seven points. But the goal seemed like a spur for the Boherlahan boys. They responded swiftly with three points from JJ McGrath (RIP), Ger Flanagan and Aidan Flanagan. Then in the 11th minute, a goal from Philip O’ Dwyer and the game was wide open now. The mighty Mid men had a new lease of life. Points were exchanged. The sides were level and, in the dying minutes of the game, Liam Maher, the veteran of the team at 36 years of age, sent the ball between the posts to give Boherlahan the lead for the first time, and victory when referee Willie Barrett sounded the final whistle. It was a time to remember. After so many years in the wilderness, Boherlahan-Dualla had arrived in the promised land. Captain Philly Ryan climbed the steps of the New Stand to lift the Dan Breen Cup. Toomevara had come up against a greater hunger but must have felt that they had left victory behind them. The celebrations that followed on the pitch after the presentation and that evening at the parish hall would be remembered for many days. We celebrate those great men 20 years on and hope some day that the new talent in the parish will rise again and take Dan Breen back to the home of hurling again. Charlie Ryan, 5th class, Ballytarsna NS.